A look at what clients will be asking for in kitchen and bath design in 2015. It takes a long time for trends to pass through the system. In kitchen and bath design there are so any moving parts—from style and shape, to color and product choice—that manufacturers can't possibly keep up with frequent shifts in taste. Landon, a Seattle-based certified master kitchen and bath designer who teaches "Customized Design" for NKBA University. Getting at that answer will help remodelers understand their clients and can lead to better design solutions. Landon believes that "personalization" is driving all home design trends. "We have personalized screen savers; we order personalized drinks at the coffee shop," he says. It's not enough for remodelers to want to do things in a cost-effective way. "They need to do them in a personal way, which involves a different mindset. Clients are getting used to controlling the world and having [things done] their way." How can a remodeler sort the enormous amount of information when a client shows them photos and says, 'Here are the things I like'? Landon suggests asking "what-about" questions rather than "why-do-you-like-this" questions. "That's an endless loop that goes nowhere. 'What about' opens the door to deeper understanding of what [a space/design] feels like." What follows are 14 (and a half) trends that will be speaking to clients' design sensibilities in the coming year—and likely beyond. Style is all about what makes homeowners feel good—the third leg of Landon's life triangle for design, which he acknowledges is inspired by the book Emotional Design: "It should look great, work well, and feel right." Mostly that seems to be through a mix of contemporary and traditional—in other words, transitional. Maria Stapperfenne, president of the National Kitchen and Bath Association and a certified kitchen and bath designer with Tewksbury Kitchen and Bath in Whitehouse Station, N.J., sees "transitional as the number one style with its clean, simple lines." The Research Institute for Cooking and Kitchen Intelligence, reported that 47 percent of designers surveyed chose transitional as the top style. For example, says George Edwards, COO of A&C Kitchens & Baths in Chester Township, Pa., "The farmhouse sink is popular here; it gives an old-fashioned look. Homeowners are pairing that with more contemporary cabinets." "One of my clients summed it up perfectly," says Justin Hamilton co-owner of Hamilton Stern in Pittsford, N.Y., "when he asked for a 'rustic farmhouse kitchen with modern undertones.'" Hamilton sees this trend connected with wider concepts in the "craft movement and in microbrews and things with an organic feel." People want to move away from mass production and "pull from popular trends and make things their own." The dining room, living room and kitchen are one for all and all for one. DreamMaker Bath and Kitchen remodeling franchise owners across the United States see a growing demand for "big, open kitchens with large center islands." Jennifer Strohl, a DreamMaker franchise owner in Bradenton Fla., reports that her company is removing "a lot of the old drop ceilings, soffits, terrible lighting, and full or partial walls in order to make the space feel completely different." 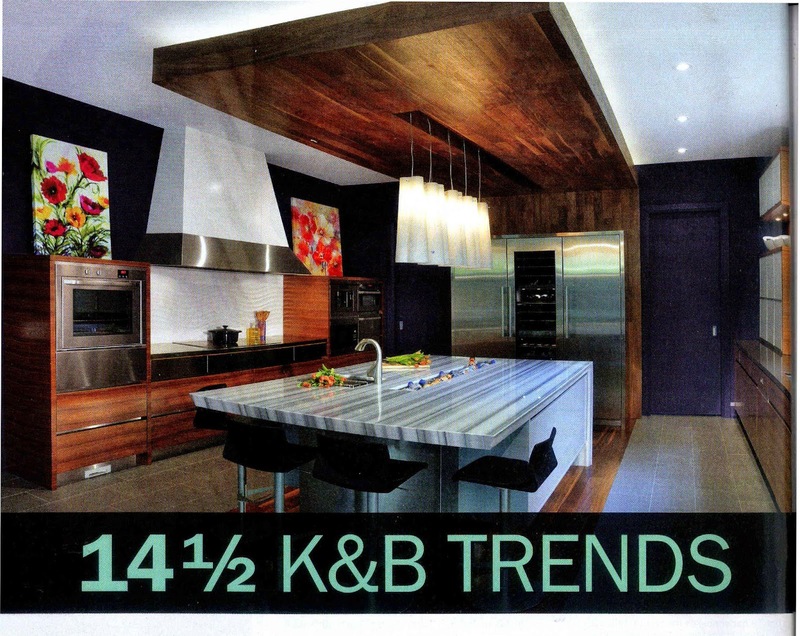 Transitional Trends: A more traditional design, including the beadboad ceiling treatment and two-tone cabinets. the metal farmhouse sink and pendants mix rustic with modern. This floor plan has driven product trends because the kitchen is now part of the living room. "It's the social space of the home ... and we're seeing more furniture-like treatments there," Landon says. Islands and cabinets with legs—whether with or without toekicks—are one example. It's all about contrasts. Dark and light. Rough and smooth. Shiny and matte. In cabinets, for example, designers are specifying different faces. "Upper cabinets are getting painted while base cabinets are stained," says Sarah Reep, director of designer relations and education for Masco Cabinetry based in Ann Arbor, Mich. "The island may be painted one color in contrast to a dark wood floor. There's a good mix of white and wood. Clients value wood flooring and that's driving an interest in paint." 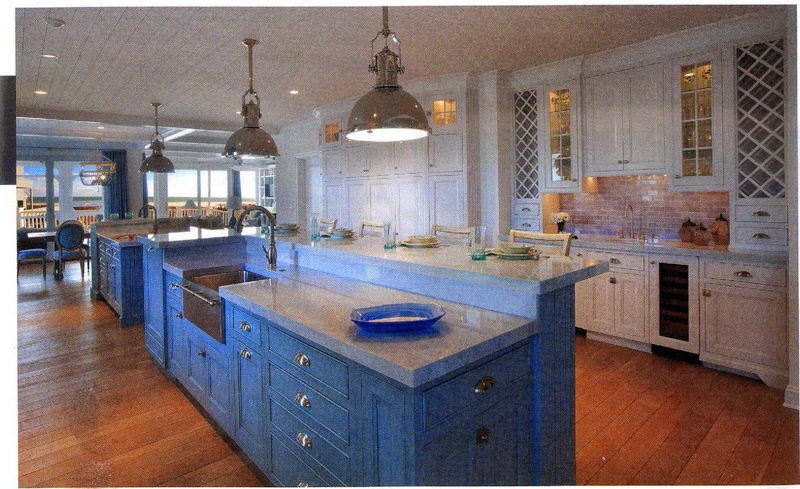 Hamilton says he sees "a lot of two tone-painted perimeter cabinets with either an antique finish on the island or a stained island." "There's something grounded and rooted about texture," and floors and backsplashes are a good place to establish texture, says Paula Kennedy, a certified master kitchen and bath designer and owner of Seattle's Timeless Kitchen Design. And although it "hasn't come to the Northwest yet," she says more designers are using wallpaper to add texture. In December, Pantone proclaimed marsala its Color of the Year. Described as an "earthy wine red," it has hints of brown. "Sometimes Pantone colors come into the home, but they start in fashion," Kennedy says. Last year's "radiant orchid" didn't create a big in-home craze, and it remains to be seen if marsala will make its way out of the wine bottle or off the runway and into the kitchen, but both Kennedy and Stapperfenne say clients are asking for dark espresso and rich saddle brown stains. Making a bigger impact in 2015 will be gray, which Kennedy, who teaches a color course for NKBA University, calls a "true neutral, way more than beige is." She admits that she didn't think the gray trend would last long but "it has stuck around." Reep says "gray is very strong and very successful on the West Coast—especially among younger consumers." Clients are opting for adding more eye-catching color in their decor—rugs, pillows, and draperies. "What clients are asking for is a great judge of where we're heading. More people are asking for color. They're not afraid of it and that's usually a sign they're more optimistic," Kennedy says. tile that looks like wood. There are still plenty of homeowners who want cabinet hardware to match faucets, appliances, pendant lights, and range hoods. Matching the faucet and the appliances "feels right to clients and not risky, but with a little bit of flash," says Reep. All the designers interviewed here agree that different metals, like hammered copper and bronze, are making their mark, too. Says Bryan, "We still see bronze as an interesting finish for faucets, especially in kitchens that are Shaker or farm style." Granite and quartz are still dueling it out for kitchen counters and bath vanities, but quartz may edge out granite in the coming year. "When we talk to kitchen designers, they say that they see quartz trending up," Bryan says. Just as granite's popularity filtered down to the mainstream from higher-end kitchens, "We'll see the same thing with quartz. Granite is kind of past and we know quartz will make its way to mainstream America." DreamMaker reports that "Cambria quartz countertops are be¬coming a favorite because they do not require the maintenance of granite." Edwards also says he's seeing a quartz trend. "It's a more sealed product and the color is more consistent." No surprise, he's specifying a lot of quartz in whites and grays. With the trend toward the open kitchen as part of the main living area, clients want wood floors, which can extend into the great room, and living and dining rooms. Wood adds texture and warmth to the kitchen's hard, metal, and shiny surfaces, and can echo the cabinetry. In Seattle, "where 99 percent of homes have hardwood floors, we went through a phase of beautiful but dark espresso-all¬most black stained floors. Moving forward that's going to lighten up a bit but will still add warmth," Kennedy says. She's specifying a lot of hand-hewn floors. "People like that rustic, weathered driftwood feel," she says. Even in the bathroom, people are asking for wood or a porcelain tile that looks like wood, Kennedy says. Houzz recently reported that in 2015 we'll see new emphasis on ceilings. Landon agrees. "People will pay more attention to ceilings, creating bulkheads, coffering, adding embellishments." He sees it as part of the personalized space trend. "People are treating the kitchen as part of the living room and they're creating spaces for themselves to express their personality." From banquettes with hinged tops to toe kick drawers under cabinetry, storage is at a premium, especially with a push toward fewer upper cabinets. Landon says the "scullery is an emerging trend"; remodeler Gary Rochman, owner of Rochman Design-Build in Ann Arbor, Mich., points to the popularity of mudrooms; Stapperfenne says homeowners want deep drawers and pantries. She often adds a tall, slim cabinet to the end of a cabinet run or along the side of a refrigerator to use as a broom closet or for backpack, and key storage. In bathrooms, too, the trend is toward creating storage for linens, medications, and laundry. "In every bathroom I'm doing, people are requesting linen storage and built-in hampers," Stapperfenne says. "People want to use aromatherapy and they want vitamin storage as well as a place to plug in electronics," Kennedy says. "People are asking for more storage, slightly deeper medicine cabinets, even some brands that have the ability to keep medications chilled." The bathroom as oasis trend continues. DreamMaker franchises report that clients are asking for larger bathrooms, especially for the master bath. "But no matter what size the bathroom is, it's a place to get away and of rejuvenation," Kennedy says. Homeowners are looking for cool, sleek lines, which gives the illusion of an uncluttered and clean space. This is what's driving the product and material trends. While floating vanities are trending for high-end and more contemporary projects—they were everywhere at Euro Cucina—that same idea is manifesting itself in more transitional style homes as a vanity with legs. Like the kitchen island, the vanity is a piece of furniture that can be personalized and easily replaced without remodeling the entire room. And the legs leave the floor open for the illusion of additional space. request for whirlpools—unless prescribed for therapeutic use—and more for freestanding soaking tubs," reports DreamMaker's Lynn Monson in St. Louis Park. If there's enough space, homeowners prefer freestanding soaking tubs over jetted or tub/shower units (top). The open space beneath a table-like vanity creates the illusion of space and eases access for wheelchair users. Walk-in showers (above), are another universal design element that also enhances the sleek lines of a more modern-looking bathroom. If space is a premium, Monson says, "The tub is abandoned altogether in favor of a larger shower." The biggest trend in showers is in zero-threshold styles with lots of bells and whistles. DreamMaker reports that "rainshower fixtures are often paired with handholds, and frameless clear glass shower doors are now the norm." All those fancy showerheads make your shower into a "standing bath," observes Stapperfenne, who's also specifying deep zero-threshold showers without doors. Kennedy notes that the rise of new drain products have made the zero-threshold shower style easier to install and, ultimately, less expensive. The popularity of apps that can control just about anything is driving the trend for electronics in the bathroom and kitchen, says Ed Webb, president of Koncerted, a "digital concierge" company. Webb, who has been automating super high-end homes for 23 years, says, "It's much more affordable now." The top trend is heated floors. "I haven't seen a home in two years that doesn't have heat in the bathroom floor using either electric or forced hot water," he says. He's also installing a lot of one-way mirrors that mask a TV set. "When it's off you see the mirror; when it's on you see the TV. They're small and flat, don't generate a lot of heat, and you can build them into the wall." Other trends include motorized shades, NEST thermostats, lighting controls, and LED lights. Webb is replacing light switches with a key pad. The zero-barrier shower and comfort height toilets making their way from ADA's compliance list and into the mainstream is why Universal Design—design for all ages and stages—is a half-trend. R. L. Mace began the UD conversation more than 50 years ago; now UD is going to bypass trend status on its way to becoming the norm. And calling it a half-trend won't stop UD's forward motion. Touch pads for lighting? They're UD. Varied height and movable counters? Also, UD. Leggy vanities you can fit a wheelchair under? Contrasts in color and texture on countertops and flooring? Motor-ized shades? All are UD.